Canonical's first Ubuntu tablet ever can run your Linux desktop applications. Canonical has officially announced the first Ubuntu tablet, confirming weeks of rumors. The device is being manufactured by Bq, which already makes several Ubuntu phones. 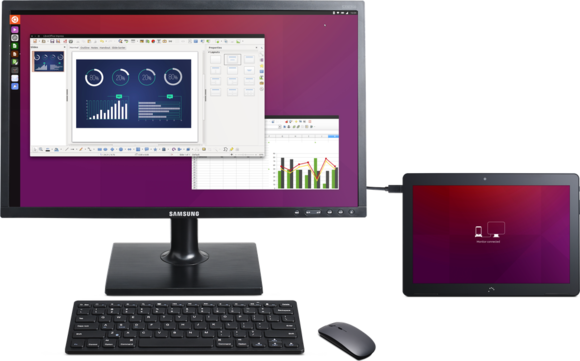 Far from being just another “me too” tablet, this hardware is a showcase for the latest Ubuntu software that can run traditional Linux desktop apps and offer a full Linux desktop experience when a mouse and keyboard are connected. Canonical’s website lists the Bq Aquaris M10 Ubuntu Edition’s specifications. To wit, it has a 10.1-inch multitouch screen, a 1.5GHz MediaTek ARM processor, 2GB of RAM, a 7280mAh battery, 16GB of internal storage, and a microSD card slot for up to 64GB of extra storage. It even features front-facing speakers, which should make for decent sound quality. The tablet will go on sale in March. According to Canonical, it’ll be available for purchase “all over Europe” directly from Bq. As this is just a Wi-Fi tablet and cellular carriers won't be involved, the Aquaris M10 will work just fine in the United States—unlike past Ubuntu phones that don’t support common U.S. cellular network standards. Hopefully, it’ll be possible to order the tablet directly from Bq even outside Europe. No price has yet been announced, but you can “Register Your Interest” on Ubuntu’s website and be among the first to hear when it’s available for sale. There won’t be any limited-time “flash sales” this time around, so you should just be able to buy it. An Ubuntu tablet can power a larger display and provide powerful desktop apps. The tablet features Canonical’s long-awaited vision of convergence. Windows 10 did it first, but Ubuntu isn’t giving up. 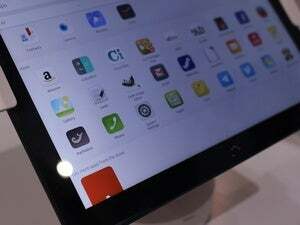 The main touch interface will be similar to the Ubuntu Touch interface found on Ubuntu phones, with Ubuntu’s unique search-based “scopes.” Ubuntu’s tablet interface also features a side-by-side view that allows you to use two apps at once, something Google’s Android tablets still don’t offer. Connect a Bluetooth mouse and keyboard and you’ll be able to use the tablet as a lightweight Ubuntu desktop. It’ll transform from tablet mode and offer you a familiar Unity desktop with windows and the desktop applications you’re familiar with. A Micro HDMI cable can connect it to a larger display. Aside from the usual touch apps, you’ll be able to use full-featured desktop apps like the Mozilla Firefox web browser, LibreOffice office suite, and GIMP image editor. In theory, any open-source desktop Linux app that can be compiled for an ARM processor should work. After years of work, Ubuntu’s Unity 8 desktop finally seems ready for desktop use in the forthcoming Ubuntu 16.04. This tablet provides some solid hardware that shows off Ubuntu’s newest capabilities.